WASHINGTON— Congressman Henry Cuellar (TX-28) secured language increasing transparency and oversight at immigration detention centers in the U.S. House of Representative’s fiscal year 2019 Homeland Security Appropriations bill. Specifically, these provisions aim to improve conditions and procedures, and expedite immigrant family reunifications. This bill passed full committee markup and is scheduled for a vote on the House and Senate Floors later this fall. A fraudulent family relationship or guardianship claims. Assesses the feasibility of using rapid-DNA testing. Congressman Cuellar additionally secured a provision enabling ICE to accept in-kind donations from the private sector, nongovernmental organizations, and other groups independent from the Federal government. This amendment will ensure that DHS has access to ample supplies in the form of in-kind donations, including medical goods and services, school supplies, toys, clothing, and any other items that will help provide for the care of unaccompanied immigrant children in custody. Requires a briefing on the cost a feasibility if an innovative fingerprinting system to be integrated as part of DHS exit tracking of immigrants. Congressman Cuellar has made it a top priority for years to improve the conditions of and increase oversight at detention facilities along the southwest border. In 2014, the Congressman was one of the first members of Congress to reveal the need for improvement at border detention facilities. Since then, he has worked to ensure the humane and dignified treatment of those who come to America’s borders. In previous appropriations bills, Congressman Cuellar secured language directing U.S. Immigration and Customs Enforcement (ICE) to make available food, water, and medical care to families in custody at the border. His language also increased unannounced inspections of ICE and U.S. Customs and Border Protection (CBP) detention facilities, ensuring that these centers are in compliance with regulations and treat the immigrants in their custody humanely. 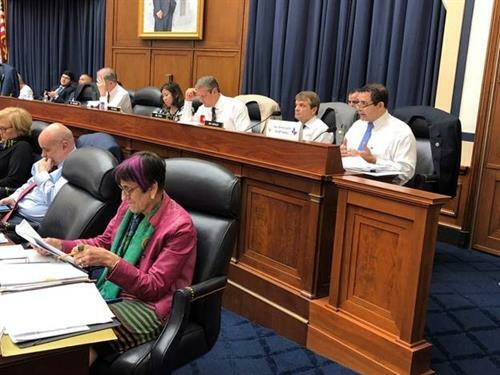 For years, Congressman Cuellar has brought the need to improve detention center conditions to the attention of the House Appropriations Homeland Security Subcommittee. The Congressman helped secure this language to address the conditions that detained immigrants become subject to after apprehension by border agents. The results of unannounced inspections of all family residential centers at least two times a year. Congressman Cuellar secured an amendment directing ICE’s Office of Detention Oversight to conduct unannounced inspections of all ICE family residential centers at least twice a year, and to be promptly published on ICE’s website. He also included $28 million for 19,000 more daily Alternatives to Detention (ATD) participants. ATD programs, which include regular check-ins and ankle monitors, provide an alternative route for certain undocumented immigrants in ICE custody. Specifically, they place low-risk undocumented immigrants under various forms of intensive supervision or electronic monitoring, in lieu of detention, to ensure their appearance for immigration hearings and, in some cases, for their removal. Child Separation Criteria Amendment - Ensures that a child is only separated from a parent if the parent has a criminal history, a communicable disease, or is determined to be unfit or a danger to the child. Detainment with Siblings Amendment - Ensures that separated immigrant children who are detained at the border are held with their siblings whenever possible. Mental Health Care for Unaccompanied Children and Families – Provides an additional $3.7 million for medical and mental health screening, triage, and referral services by specialized personnel to unaccompanied children in high volume southwest border CBP locations. An additional $3 million for trauma treatment for children and their families at CBP and ICE locations. Assurance of Congressional Oversight Amendment - Guarantees that no funding will be used to prevent a Member of the U.S. Congress from entering, for the purposes of conducting oversight, any facility in the United States, used for the purposes of detaining or housing immigrant children. Read Congressman Cuellar’s DHS Appropriations Language here. Read Congressman Cuellar’s Appropriation Langue on Detention Centers from FY15-FY19 here.